Learn how to crochet a 5 treble crochet popcorn on a chain with these helpful instructions. At the scheme below you can see a stitches of 5 treble crochet popcorn on a chain. Crochet the popcorn stitches inserting the hook under the chain stitches of the previous row. Work five treble crochet stitches in the same stitch. Drop the loop from your hook. 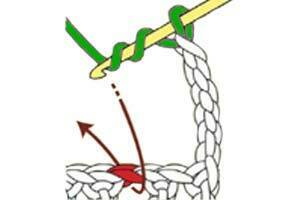 Insert your hook from front to back under the top two loops of the first treble crochet of the group. Grab the dropped loop with your hook.